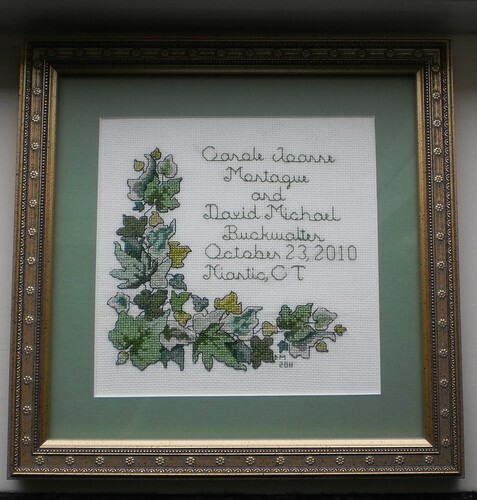 It really wasn't much of a secret that the ivy corner piece was going to be something for David and Carole on their wedding day. While I never specified that, I did say it was a gift and I was under a deadline to get it done. What else could it have been? I never posted a photo of the pre-framed finished piece, however. This was taken in the hotel room and I couldn't get a good photo without a flash off the glass, but it gives you an idea of the finished, framed sampler. I didn't wrap it before getting to Virginia as I wanted to show some people. I am pleased with the final product. 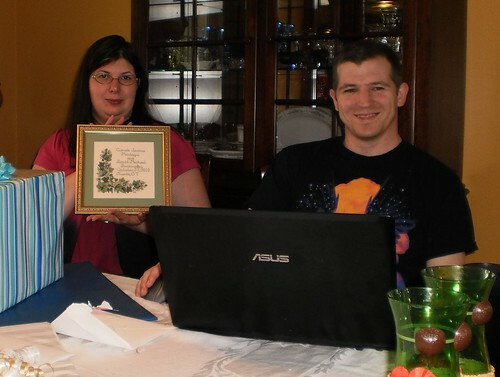 So, on Sunday, they sat down to open and record gifts. She reached for my package first. "I know what this is," she said, chuckling. When she showed off the finished sampler, I found out that a number of people have been following my blog as they said, "Oooh. So THAT'S what the finished project looks like. I've been watching the blog with the photos and I figured it couldn't just be a corner of leaves." While this sampler has the actual date they signed a marriage license, I was informed they will be celebrating May 21st as their anniversary. "Guess you'll need to make another, mom, with that date on it." I guess I do. I know exactly what I want to make but I have another project to finish first and then I have to see if I have the pattern. I guess, at Christmas, we'll hear, "I know what this is" once again.